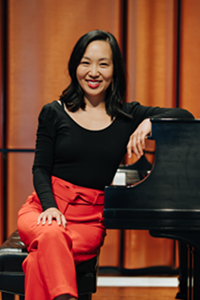 Hailed as “… a deity of elegance” by the New Brunswick Beacon, pianist Tina Chong is a sought after recitalist and chamber musician in North America. A native of Banff, Canada, Tina has been described as, “…mature and yet fresh, imbued with tradition and yet inhabited by individuality, the marks of an artist” (The Herald Times). As a passionate performer and teaching artist, Tina strives to invigorate her audiences with her infectious energy and exciting programming. She is currently being represented by Mit Bravour. Since her orchestral debut at the age of nine, Tina has appeared as a guest soloist with orchestras throughout the world including the Calgary Philharmonic, the Brazilian Symphony Orchestra, and the Mississippi Symphony Orchestra. Tina’s recital career has brought her to such venues as the Sala Chopin in Mexico City, the Sheldon Center in St. Louis, the Kennedy Center in Washington, DC, and the National Arts Centre and Rideau Hall in Ottawa. Under the management of Jeunesses Musicales of Canada, Tina has gone on several whirlwind concert tours throughout Eastern Canada. Most recently, she has been featured in the Portland International Summer Festival, Lachine Festival, and the WFMT Series of Chicago. Crafting performances of the highest artistry and virtuosity, Tina has been a prizewinner in an impressive number of major international competitions. Tina captured the “Best Canadian Prize” at the 2011 Montreal International Musical Competition, the grand prize at the 2010 CMC International Stepping Stone Competition in Canada, and second prize at the 2009 Jacques Klein Piano Competition in Brazil. Other top placements include the Aspen Music Festival concerto competition and the Seneca Chamber Orchestra Competition. An artist of great versatility, Tina has collaborated with some of her generation’s best instrumentalists and operatic singers, many of who are performing in the world’s most prestigious orchestras and opera companies. Her projects have led her to work extensively under the guidance of violinist Jaime Laredo, violist Atar Arad, clarinetist James Campbell, baritone Timothy Noble, and soprano Carol Vaness. Tina is a graduate of the Oberlin Conservatory of Music where she studied under the guidance of Angela Cheng. She has also worked closely with artist-teachers Robert McDonald, Jerome Lowenthal, Yoheved Kaplinsky, Julian Martin, Arie Vardi, and Menahem Pressler. Tina is now a doctoral candidate at Indiana University’s Jacobs School of Music having studied with Arnaldo Cohen. She is a recipient of the Indiana University Chancellor’s Fellowship and is currently being supported by the Canada Council for the Arts.